Bire leads you into the house and asks you to wait while he tells Mister Forss you've arrived. This room is softly lit by wall-mounted globes containing continual flames and a wide fireplace in the northern wall. A massive oak table in the center of the room is surrounded by a dozen comfortable chairs. You are left alone for a few minutes. Nightingale's mope is quickly overtaken by curiosity and exploration. She runs to the chair, and climbs up into it, then bounces on the cushion. "Wow! I've never seen a chair like it!" Artemis sits next to her, eyes taking in the various other treasures from across the Accordlands on display around the edges of this exquisite reception room. Jackson stands at ease as he waits, calmly noting entrances and exits. "What's that?" she asks, as she topples from her chair and crosses the room to look at something shiny. Artemis gives Jackson look, but complies, rising to follow closely behind her as she flits about the room. She finally stops to admire a large tome embossed with shining silver and embellished with deep blue sapphires. "There must be some really good stories in there!" Nightingale decides. A regal, well-dressed man enters and walks over to stand with Nightingale as she admires the book. "It's beautiful, isn't it?" he says. Nightingale startles a bit at the voice beside her, then smiles at the newcomer. He has that commanding yet comforting presence that puts people at ease. Your immediate impression is that this is a man accustomed to getting what he wants, and not someone to be trifled with. He continues without pause, "The full, illuminated text of the Annales Devereniorum. The history and wisdom of Signon lies within this book." "Someone with a name like Signon must be very interesting, indeed!" "You do not know of him? I’m assumed a bard of your talents would know many tales and ballads of Signong's mighty deeds for Deverenia. You will have to learn them, before you leave our fine city." "I'd like that very much! It's part of the reason I came. I hoped to learn more stories and songs. I'm really just a beginner, you see." Laying a hand lightly on her shoulder, he deftly turns her about and guides her back the table. "Of course, forgive me. I am Arkan Forss. Thank you coming to the aid of Cardinal Ulloft. Please, sit down and I will explain what has happened." He pulls out a chair for Nightingale. "Wow, you're really nice!" she says, and hops up into the chair. Arkan smiles down at her, then looks to Jackson. "Please, join us Mr. Lye. You are my guest and should feel comfortable in my home." Jackson moves over to the table and nods to Forss, "At the present sir I am more comfortable than if I were sitting, thank you." Artemis sits next to Nightingale once more, relaxing only once Arkan has moved to his own seat the head of the table. Arkan sits and steeples his fingers under his chin. "To business, then." Nightingale sits quietly for once, sensing the beginning of a new story being born. Last edited by MomofEaglett on Thu Mar 04, 2010 1:39 pm, edited 1 time in total. Nightingale's eyes grow wide. "We were too late?" Arkan continues smoothly. "This is not what your original contract entailed. Are you willing to find him for us? You will, of course, be compensated for your additional efforts on his behalf." Nightingale's gaze moves between Jackson and Artemis. “The contract may not have stipulated this eventuality, but to falter now would constitute a breach of contract,” states Jackson. “We will do our utmost to restore the Cardinal and see him safely away. "If Mr. Jackson wants to, I'll help too!" Artemis nods his consent as well. Arkan smiles at Jackson's conviction. "Good. Cardianl Ulloft was last seen at the Church of the Storm, preparing for the rededication. Detmer Halifax, the Captain of the Guard in our fair city, has already started his own investigation, as well. I leave it to you to decide where you want to begin." Nightingale looks at Artemis with a wondering expression. "He knows I have sent for additional help. Show him the contract and he should be satisfied." He gives you directions to find Captain Halifax. It's not far. "If you wish, I can provide a carriage to take you there." Artemis meets Nightingale's eyes for a moment, then his attention is pulled back by Arkan's last statement. He speaks up. "Your offer is kind, but we may able to pick up more information if we go there on foot." He looks at his companions, obviously expecting them to follow his lead. “Just as I was thinking,” Jackson nods. 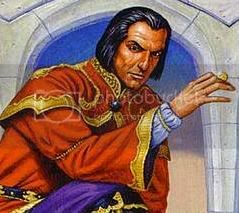 "Sensible of you," Arkan says, rising to his feet. "Yes, the carriage ride was lots of fun! But what I can see is limited by that tiny window." Nightingale squints her eyes for a moment. "I want to see more of your home, Mr. Forss.” She stops to correct herself. “Or rather, your city. Though I'm certain there are many wondrous things in your home, too!" She looks a bit flustered. Arkan smiles down at her. "If I were not so concerned over the welfare of our Cardinal, I would enjoy showing you my home. Perhaps after he has been found safely?" He continues without waiting for her response. "If our business is concluded, Denton will see you out." He nods to them a final time, then turns to leave. "Stay well, Mr. Forss!" calls Nighitngale. "And you." Arkan responds, before closing the door behind him. Denton Bire appears at his master's words, holding the other door open for you on your way out. Nightingale hops down, and tries to take her friends' hands. "Shall we, then?" Artemis allows her take his hand, walking slowly so that Bire is more than a few paces ahead of them. He gives her little a quick squeeze and asks her quietly, "What was on your mind in there, little one? You looked at me as if you wanted to share a thought or question." "Umm," she replies with a finger to her lips and a sideways glance. Then, with a huge grin, she raises her hand up and says, "I forgot!!" Jackson strides past Artemis and Nightingale, nodding to Bire on his way out of the room. Artemis shakes his head and releases her hand. "If you remember, I'd like to hear what has intrigued your mind." He follows more quickly after Jackson. Bire nods at each of them as they exit his master's home. Past the manicured lawn and out on the street, Artemis stops them. "I want to see if that old beggar is still hanging around here. Will you help me look for him?" he asks. As he exits the building Jackson continues his careful appraisal of his surroundings. Stopping on the edge of the street he turns to Artemis, "Perhaps it would be best if Nightingale and I continued on to meet with Captain Halifax while you try tailing that beggar." Artemis nods. "If I can't find him within the hour, I'll look for you at Halifax's." He turns and disappears among the people going about their business today. 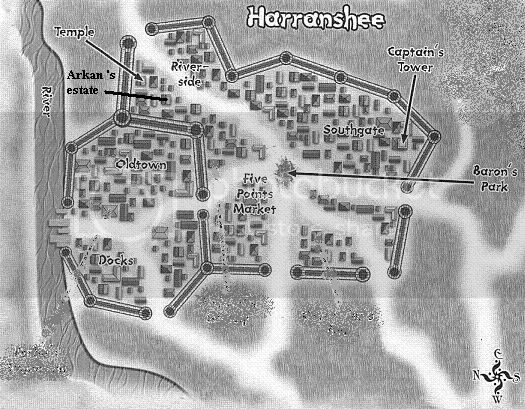 Here in the Riverside district of Haranshee, the streets are wider and quieter than they were in the docks and Oldtown districts. Nobles stroll up and down the avenues, and wealthy manors are interspersed with shops of luxury goods, gambling parlors, and the occasional library where the elite of the city may spend their time and coin. Parks and small shrines provide places to rest and socialize. The neighborhood seems to be well patrolled by roving guards. Leaving the Riverside district, you pass by the edge of the Five Points Market, a bustling and prosperous area of merchants and traders running their businesses from freestanding stalls and shops or out of larger warehouses. You can see at least two inns on this side of the market, taking advantage of the influx of refugees. A few food vendors flow over from the market into the "Baron's Park," a patch of green in roughly the center of Haranshee, where you see people from the elite class to the working class sitting, talking, or strolling together. Once you pass the park, you're in the Southgate district. Row houses line the narrow streets, many with apartments above them. There are more free standing businesses here where craftsmen, smiths, and other artisans come to work. The smells change constantly as you move past each business. Dust, iron, leather, dyes and other by-products. The people on the street walk with more purpose. The Captain's Tower is on the far south side the Southgate district. Last edited by MomofEaglett on Thu Mar 25, 2010 12:27 pm, edited 1 time in total. As Artemis leaves to stalk his quarry, Jackson looks down at Nightingale, "Shall we go see Captain Halifax together? As I recall I owe you a few explanations?" Nightingale returns Jackson's gaze with a quizzicle expression. "Explainations . . . explainations . . . ," she mutters as she thinks. "Oh! Right, your very large family! I'm happy for you having that, but is it really ok being away from them this long? Maybe we could visit them!" "No Nightingale, I've never been engaged to be married. All my family perished in the last Elven invasion. But I would have thought that as a bard you would recognize that words can have many meanings, depending on the context. The word engage can mean a promise to get married but it can also mean meeting with and fighting an enemy." Jackson carries on his conversation with the small Nimbic while maintaining a careful awareness of their surroundings and walking through the steets of Haranshee toward the Captain's Tower. "I . . . I'm sorry to hear about your family," she replies solemnly, but perks up again almost instanteneously. "And that just doesn't make sense! Why would people use the same word to talk about love or war? They're complete opposites! Brother never said anything about that, either. Are you sure you aren't mixing up words?" Walking at a pace that won't exhaust Nighingale, the two make for an odd sight as they stroll through the Riverside district. "No, I'm sure I'm not mixing words. Didn't your brother teach you that poetry and song make use of various meanings in words to convey subtle nuances? Neus eyes! It feels like years since I gave any thought to the art."